The Brewers Arms and Old Bakehouse Restaurant are found at the centre of the bustling Hamstone village of South Petherton, just half a mile from the A303. Dating from the 17th century, this old coaching inn has much to offer with its lively village bar, relaxed dining rooms and three en-suite bedrooms. 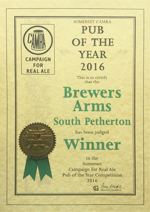 The Brewers Arms has been awarded ‘Taste of the West’ silver and gold awards, Western Gazette Pub of the Year in 2013 and was Somerset CAMRA Pub of the Year for the third time in 2016. 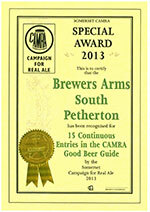 The Brewers Arms has gained a reputation for serving quality real ales from all corners of the British Isles. 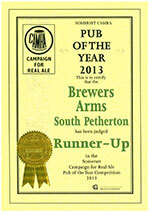 Having won Somerset CAMRA Pub of the Year on two occasions and runner up on three separate occasions. Over 2400 different real ales have been served over the years. Our regular house beer is Otter Bitter with another pump dedicated to brews from Butcombe Brewery. These are complimented with a further three guest ales and four ciders including one guest cider. Our wine list boasts ten wines by the glass and our malt whisky selection ensures all tastes are catered for.